Former Congressman Bob Beauprez, who has widely been expected to jump into the GOP gubernatorial primary, is expected to enter the race early next week. GOP sources told the Denver Post that Beauprez has been looking at office space in the Denver Tech Center and at staffing hires. FOX 31 Denver reported that Beauprez will enter the gubernatorial race Monday, the same day he’s expected to appear in Washington, D.C., before the Republican National Committee in an effort to lure the 2016 convention to Denver. But Tancredo said he told Beauprez that didn’t mean he would jump out of the race. “I’m committed to this thing until somebody can show me a person that can raise millions of dollars that I can’t or has polling that shows he or she is going to walk away with it,” Tancredo said. Tancredo leads a pack that includes Republican Secretary of State Scott Gessler, state Sen. Greg Brophy, former state Sen. Mike Kopp and businessman Steve House. The winner of the June 24 GOP primary faces Democratic Gov. John Hickenlooper, who is vying for a second term and in recent polls has outpaced all of his prospective challengers. 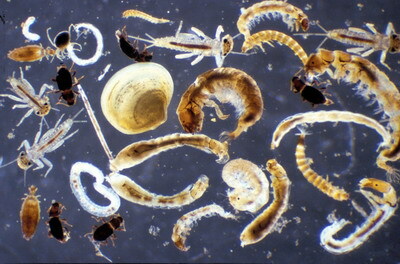 The effects of aquatic contaminants are propagated across ecosystem boundaries by aquatic insects that export resources and contaminants to terrestrial food webs; however, the mechanisms driving these effects are poorly understood. We examined how emergence, contaminant concentration, and total contaminant flux by adult aquatic insects changed over a gradient of bioavailable metals in streams and how these changes affected riparian web-building spiders. Insect emergence decreased 97% over the metal gradient, whereas metal concentrations in adult insects changed relatively little. As a result, total metal exported by insects (flux) was lowest at the most contaminated streams, declining 96% among sites. Spiders were affected by the decrease in prey biomass, but not by metal exposure or metal flux to land in aquatic prey. Aquatic insects are increasingly thought to increase exposure of terrestrial consumers to aquatic contaminants, but stream metals reduce contaminant flux to riparian consumers by strongly impacting the resource linkage. Our results demonstrate the importance of understanding the contaminant-specific effects of aquatic pollutants on adult insect emergence and contaminant accumulation in adults to predict impacts on terrestrial food webs. The agriculture industry convened Thursday to discuss ways of better connecting with consumers now and into the future — when food buyers will be far different than they were just a few years ago. It’ll be no easy task, they were told. Many left the Governor’s Forum on Colorado Agriculture with more questions than answers. As was noted by industry experts who spoke, many of today’s consumers put value on food that’s “local,” or “organic,” or “naturally raised,” or “anti-biotic free,” or “cage-free,” although many food buyers admit confusion regarding the details of those labels, and also reveal they’re only willing to pay so much more for it. “They want it all, and they want it at a fair price,” said Dawn Thilmany, a Colorado State University professor and economist, who shared results from a state survey of food consumers. Those talks were part of the annual all-day ag forum this year “Titled Farm To Table,” which brought together state ag officials, experts and farmers and ranchers, and featured a brief speech from Gov. John Hickenlooper. Among the other facts and figures shared by Reed and others; the U.S. population that’s 55 and older will grow by 45 percent by 2020, while the number of people in the U.S. 18 and younger will decrease by 8 percent by that time. By 2020, 75 percent of the population is expected to be overweight. The obesity rate will double, 20 percent of the population will have arthritis, 40 percent will have heart disease and 50 percent will have diabetes. “And all of this will impact how we market our products,” he said. Also, men are expected to be the primary grocery shopper of the household by 2020. Right now, 31 percent of men are the primary grocery shopper in the household, Reed noted. Reed also spoke of the “loss of the middle.” People today, and likely into the future, either want gourmet food or something really cheap. “There are a lot of ag products that go into Kraft Mac And Cheese … but no one’s really eating things like that any more,” Reed said. Dieting has changed, he added. Everyone’s overstressed — “but not everyone wants 5-hour Energy. They want something else,” he said. People are having less kids, and parents want to be friends with their kids — and as a result, are changing how they feed them. People snack more. Reed’s survey results showed only 17 percent of people don’t snack, and some snack as many as five times per day. People don’t trust products — they trust brands, he added. Technology, too, is changing. Average appliances will include refrigerators that keep track of inventory and make grocery lists. In South Korea, smart phones scan food billboards at train stations that automatically charge consumers for wanted items, and then have the food delivered to their homes by the time they get home. “But there’s always room for new products,” Reed added. Spring flooding could destroy some CDOT repairs to major highways destroyed in September, said Sheaffer, who said he has obsessively monitored the state’s above-average snowpack. “We have a 25- to 50-year (flood) event coming to us if it’s just a normal spring runoff,” said Sheaffer, who has become CDOT’s chief of operations for flood recovery efforts since September. Although CDOT is still working to repair $535 million in damage done to Front Range roads, road repair is only a sliver of the long-term recovery concerns that flood and stormwater experts discussed on Thursday. Hosted by the Colorado Association of Stormwater and Floodplain Managers and Colorado State University, the 2013 Colorado Flood Forum covered subjects ranging from climate and weather to water quality issues. The conference also served a statewide debrief on the September floods that killed eight people and destroyed more than 1,500 Front Range homes. Record-setting warmth accompanied dry weather from California into the Southwest, while beneficial precipitation fell from the Pacific Northwest to the northern Rockies. Benefits of California’s early-February precipitation are being overcome by resurgent warmth and dryness, leading to rapid expansion of extreme to exceptional drought (D3 to D4) into the San Joaquin Valley and the southern Sierra Nevada. By February 26, the California Department of Water Resources reported that the Sierra Nevada snowpack contained an average of 5 inches of liquid, just 22 percent of the late-February normal. Prior to the early-February storminess, the water equivalency of the Sierra Nevada snowpack was 3 inches, about one-sixth of the end-of-January normal. From a broader perspective, California completed its 12th-driest year from July 1, 2011 – June 30, 2012, and its 11th-driest year from July 1, 2012 – June 30, 2013, according to the National Climatic Data Center. During the last 120 years, the only comparable period for dryness occurred from July 1, 1975 – June 30, 1977, when California experienced its fourth- and third-driest years on record. However, that drought ended with heavy winter precipitation in 1977-78. This year, California is on track to complete one of its driest years on record; the period from July 1, 2013 – January 31, 2014, broke an all-time record for dryness. Heat has certainly not helped California’s drought situation; Needles—with a high of 90°F on February 19—reported its earliest ever 90-degree reading (previously, 90°F on February 24, 1904). Sandberg, California, has reached or exceeded the 70-degree mark on 7 days in February; the previous standard of 4 days was established in February 1963. California’s drought impacts continue to mount, with one of the most recent blows to agriculture being that the Central Valley Project plans to deliver no water to many growers in 2014. The most senior rights holders are pegged to receive 40 percent of their normal water. Those allocations could change if reservoir storage were to improve. Some growers could make up the loss by pumping groundwater or buying water from senior rights holders. 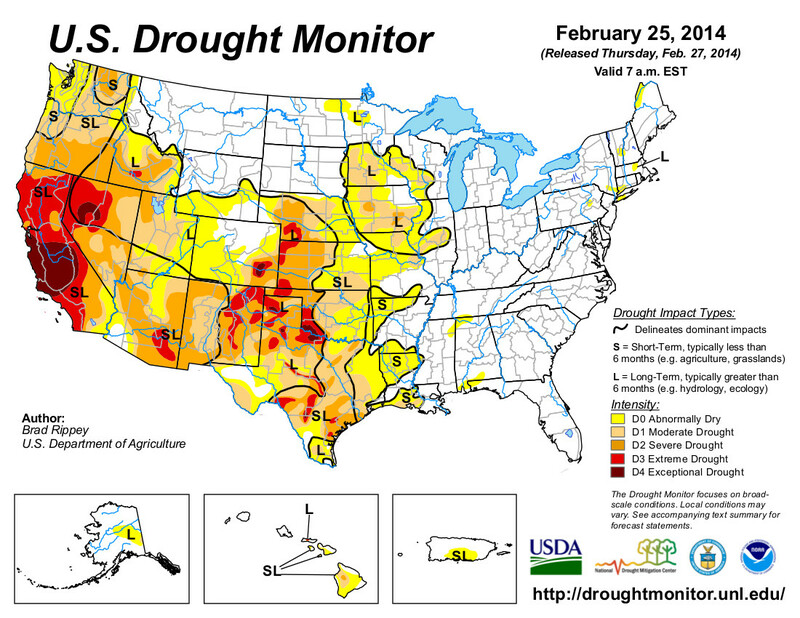 From February 27 – March 3, precipitation will engulf much of the West. Five-day precipitation totals could reach 2 to 4 inches or more in the Sierra Nevada and 3 to 6 inches along the California coast. Totals of 1 to 3 inches will be common elsewhere in the West, except for locally higher amounts on Arizona’s Mogollon Rim. Late in the period, a sprawling storm will affect the central and eastern U.S. Snow, sleet, and freezing rain can be expected across portions of the Plains, Midwest, Mid-South, and Mid-Atlantic States. Another strong surge of frigid air will trail the storm into the Plains and Midwest. The NWS 6- to 10-day outlook for March 4-8 calls for below-normal temperatures from the Plains to the East Coast, except for warmer-than-normal weather in southern Florida. Warmth can be expected west of the Rockies, excluding areas near the Canadian border. Meanwhile, above-normal precipitation in the Pacific Northwest and the Atlantic Coast States will contrast with drier-than-normal conditions in a broad area stretching from central and southern portions of the Rockies and Plains into the middle Mississippi Valley. For several months now a group of agricultural producers on the Colorado River have been meeting to develop their section of the pending Colorado Water Plan. Whether you are a wine producer in Mesa County or a cattle producer in Grand County, water is the key to success and survival. And even though the snowpack is looking pretty good at the moment, there isn’t enough water to meet all of today’s needs let alone new future demands. Agricultural water users are feeling pressure from a number of directions. Looking upstream, they see a growing population on the Front Range of Colorado. Water users east of the continental divide have not minced words regarding their desire to transfer additional water from West Slope agricultural users to the Front Range. Looking downstream, agricultural water users on the Colorado watch the declining levels of Lake Powell and Lake Mead and speculate as to how much of the water they are currently relying on to raise their crops will have to be bypassed to meet Colorado’s compact obligations. And last, but not least, population numbers within the Colorado Basin are on the rise, and pressure to sell agricultural water for municipal use is ever-present. The agricultural section of the Colorado River “Basin Implementation Plan,” developed by the Colorado Basin Roundtable with help from the consulting firm SGM, will be incorporated into the statewide Colorado Water Plan that Governor Hickenlooper is seeking to finalize by year’s end. The Colorado Basin Roundtable, like its counterparts in other major river basins around the state, is a group of water managers and stakeholders charged by the state legislature with doing “bottom-up” water planning. SGM is working with agricultural water users throughout the river basin to determine what their needs are and what kinds of projects and methods would help them be more prepared for the future. A number of themes have emerged during the roundtable discussions to date. These include a desire to address the existing shortage of water supply available to agricultural users, consensus by all that additional transmountain diversions would harm agricultural production, a desire to preserve the right of an individual landowner to do what he or she wants with their property and water rights, and general agreement that improved agricultural efficiencies would have limited water supply benefits in the basin. The discussion participants have also concluded that administration of the Colorado River Compact due to a failure to meet downstream obligations would have a negative impact on the viability of long-term agricultural production in the basin. The Colorado Basin Implementation Plan agricultural discussion group will continue to meet in conjunction with the monthly meetings of the Colorado Basin Roundtable. Next on the agenda will be identifying individual projects and methods that could provide agricultural benefits in the Colorado Basin. If you would like to join in on the conversation, we would love to hear from you. Meetings are held the third Monday of the month at noon at the Glenwood Springs Recreation Center. For more information, please feel free to contact Angie Fowler at SGM, AngieF@sgm-inc.com. 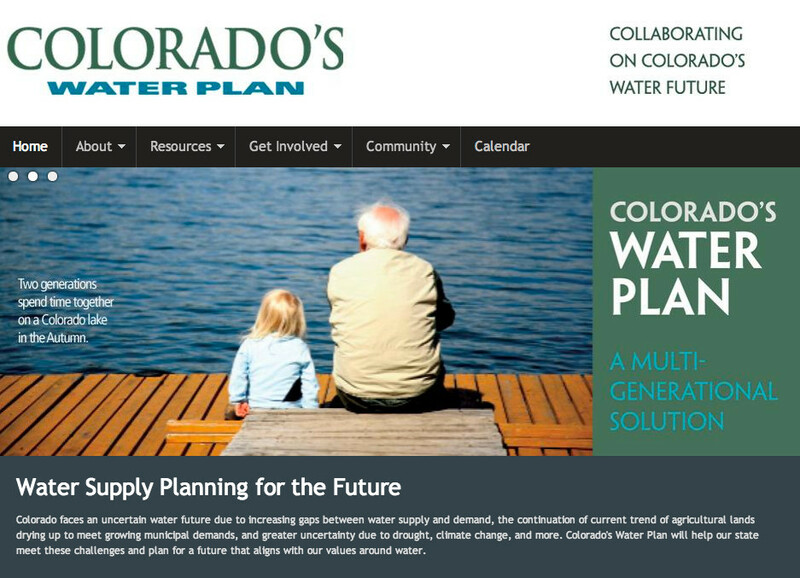 To learn more about the Colorado Basin and statewide water planning processes, go to http://www.coloradobip.sgm-inc.com. You can also contribute your knowledge and opinions by taking a short survey a http://www.surveymonkey.com/s/ColoradoBasinAg. The meetings will be held from 4-6 p.m. on the dates and at the locations indicated below. Roundtable representatives will also be available starting at 3:30 p.m. until up to 7 p.m. for informal discussions. The meetings are free and open to the public. More information about the South Platte Basin Plan is available at http://www.southplattebasin.com. Bureau of Reclamation Great Plains Regional Director Michael Ryan has signed the Record of Decision for the Arkansas Valley Conduit and Long Term Excess Capacity Master Contract Final Environmental Impact Statement. The selected alternative is construction of the Arkansas Valley Conduit using the Comanche North Alternative. Construct and operate the Arkansas Valley Conduit and enter into a repayment contract with Southeastern Colorado Water Conservancy District. Enter into a conveyance contract with various water providers for use of a pipeline interconnect between Pueblo Dam’s south and north outlet works. Enter into an excess capacity master contract with Southeastern Colorado Water Conservancy District to store water in Pueblo Reservoir. “For the many small rural water providers the conduit will serve, this critical step in the process of building the project is greatly welcomed. Facing the water quality and waste water discharge compliance challenges has been daunting for this area, and the congressional approval in 2009 and now the Record of Decision from the Bureau of Reclamation provide real hope for an effective and efficient way to meet those challenges,” said Bill Long, President of the Southeastern Colorado Water Conservancy District. A Record of Decision is a decision document; it concludes the environmental impact statement prepared in compliance with the National Environmental Policy Act. It does not provide or allocate funding for the project. Reclamation published the final environmental impact statement in August, 2013. “The District is grateful for this decision, which is one more milestone in a half-century journey to a clean water supply for southeastern Colorado. As federally-mandated standards have changed, the need for the solution the preferred alternative provides is even greater. The promise to build this piece of the project was first made in 1962 by President Kennedy and was restated in 2012, right here in Pueblo, Colorado, by President Obama. Now let’s move forward to the next phases of design and construction,” said Jim Broderick, General Manager for the Southeastern Colorado Water Conservancy District. For more information on the Record of Decision, please visit http://www.usbr.gov/avceis. To obtain a hard copy of the Record of Decision, contact Doug Epperly at (406) 247-7638 or depperly@usbr.gov. The Bureau of Reclamation approved the final construction plan for the Arkansas Valley Conduit Thursday. The record of decision for the project was signed by Michael Ryan, Reclamation’s regional director. The record of decision includes the environmental impact study for the conduit, but the next step will be to obtain funding from Congress to build the project. Long, a Bent County commissioner and Las Animas business owner, has been working to get the conduit built since he joined the Southeastern board in 2002. The conduit was included in the 1962 Fryingpan-Arkansas Project legislation, but never built because of the expense. “In the last few months, it’s become clear that this will help, not only with drinking water, but at the other end with wastewater quality as well,” Long said. 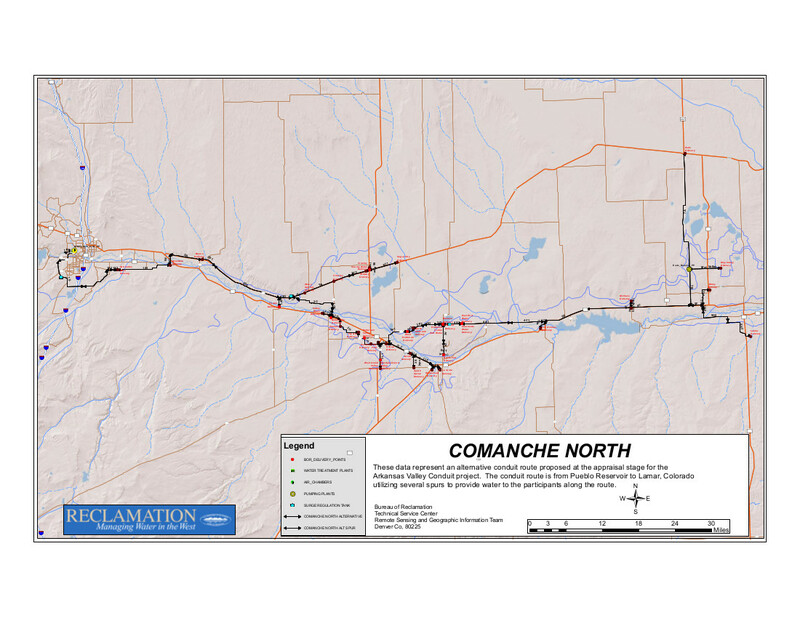 Reclamation Thursday approved a record of decision for the Comanche North route of the 227-mile pipeline from Pueblo Dam to Lamar. The chosen route includes initial treatment at the Pueblo Board of Water Works’ Whitlock treatment plant and a pipeline that swings south of Pueblo near the Comanche power plant. The conduit will deliver fresh drinking water to 50,000 people in 40 communities east of Pueblo. It is estimated to cost $400 million, which would be repaid partly through revenue from Fry-Ark contracts. Also included in the decision is a master storage contract in Lake Pueblo for the Southeastern district and a cross-connection between north and south outlets at Pueblo Dam. The storage contract will set aside space for conduit participants and other water users in the district. The Southeastern district is focused on funding the project. Political wrangling delayed the record of decision and federal belt-tightening limited appropriations to about $2 million this year, rather than the $15 million the district hoped for. The Bureau of Reclamation signed the Record of Decision today for a project that’s been in the planning stages since Pueblo Dam was built in the 1960s. 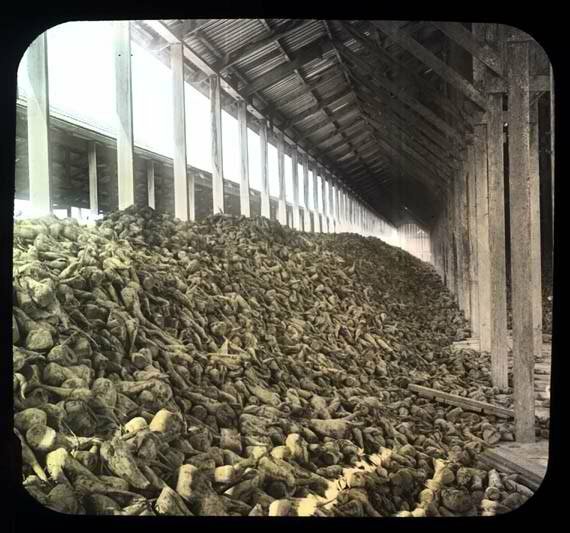 Part of the Frying Pan-Arkansas project, the conduit has never been built due to lack of money. U.S. Sens. Michael Bennet and Mark Udall, Democrats of Colorado, issued a news release after the ROD was signed, which follows approval of an Environmental Impact Study last year. U.S. Senators Mark Udall and Michael Bennet welcomed today’s signing of the Record of Decision for the Arkansas Valley Conduit, which represents a major milestone for the project that will bring clean water to communities in southeastern Colorado. The decision comes after Bennet and Udall urged the Bureau of Reclamation to quickly approve the Conduit’s Environmental Impact Study (EIS) that was finalized last August. Udall and Bennet have led efforts to secure resources and move forward with the construction of the Conduit. In addition to advocating for quick approval of the EIS, the senators have written to the Department of Interior to provide adequate resources for construction of the Conduit in future federal budgets. The Arkansas Valley Conduit is the final component of the Fryingpan-Arkansas Project, a water diversion and storage project in the lower Arkansas Valley. Once constructed, the Conduit will deliver clean drinking water to families, producers and municipalities throughout Southeastern Colorado. Bennet and Udall worked together to enact legislation in 2009 authorizing the construction of the Conduit, and have pushed ever since for funding to keep the project on schedule. More Arkansas Valley Conduit coverage here and here.